Ubuntu 16.04 LTS (aka Ubuntu Xenial) was released about two months ago, and can run new performance analysis and troubleshooting tools thanks to its Linux 4.4 kernel. These tools use enhanced BPF, and there's a growing number of front ends, including bcc, which I've written about before. Let's take a quick look. 0 upgraded, 11 newly installed, 0 to remove and 80 not upgraded. At some point bcc-tools should also be available as an Ubuntu snap, making the install process even easier. The bcc install docs also contain instructions for an Ubuntu source build of bcc, which you can do if you want to develop your own bcc tools. This is more efficient than my earlier versions of this tool, as it times events in kernel context, and only sends the summary lines to user space for printing. This tool uses BPF to create a custom histogram that is counted in kernel context, for efficiency. Only an array of numbers (the "count" column) is transferred to user space. You can browse the *example.txt files in the bcc tools directory for more screenshots and examples. Some are single-purpose tools, like biolatency and ext4slower, and some are multi-tools, like trace and argdist. All tools have man pages, and example files (see previous links). biosnoop - Trace block device I/O and print details incl. issuing PID. Usual warnings about tracers apply: even though BPF is JIT-optimized kernel context summaries, you could trace such a high frequency of events (millions/sec) that the performance overhead slows other apps. Test in a lab environment before use. Ubuntu Xenial is also a 4.4 kernel, and the bcc tools are developed for the latest kernel, so some tools may not work. We've been putting older versions under /usr/share/bcc/tools/old, which might be worth checking. For example, tools that print stack traces (eg, stackcount) won't work on Xenial (which is missing the newer BPF stack trace support), but the tools/old versions may work instead (although they were workarounds until proper support existed). 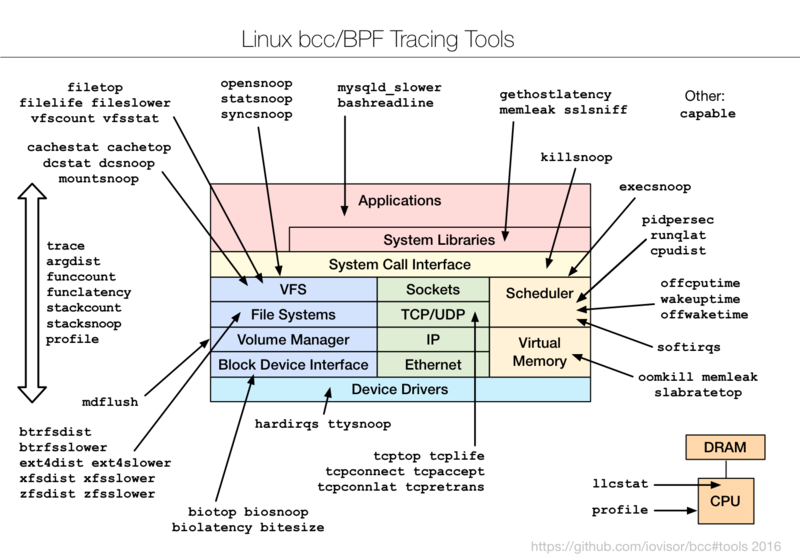 bcc/BPF has more capabilities that the tools don't use yet, but will over time. See my bcc/BPF road ahead post for what's next.